I love a good regency novel. Imagine how happy I was when I found I could get several in one setting that are easy quick reads. I also love this book because it introduced me to new authors that I have never tried before, giving me a new opportunity to read their other books. This story was a new approach to the popular classic of Pride and Prejudice. There are several remakes and takes of the romantic love story. However, this is the first one that I’ve come across that takes a stab at what happens with Mr. Darcy and Elizabeth Bennet after they are engaged. 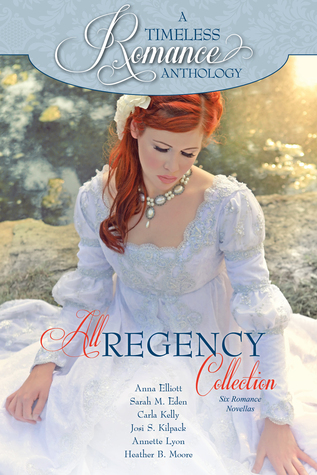 This story takes on a mystery/suspense twist when Elizabeth Bennet finds herself thrown in a carriage and kidnapped. We follow this story in the form of a diary. I love the writing and find myself very excited to read other stories by Anna Elliott. I was caught up in Elizabeth’s character and was disappointed to have the story end. Stuck in a world of expectations thrown at her by society, Elizabeth Gillford finds herself stuck at home and forced to watch an older sister Come out and enjoy her several seasons. Elizabeth is unable to make her “first bows to Society” until Mary, her mean and selfish sister is wed. Elizabeth has also found herself in love with Julian Broadwood, the neighbor, and has been since she was 8 years old. However, he has been “promised” to her sister. Heartbroken and looking as though she is to be an old maid, Elizabeth has an inviting personality and doesn’t let this break her. As a reader, I find myself cheering for her and Julian. Once again, another author that I will be looking into. A story of a young woman looking for adventure and stumbles onto one that is far greater than she could ever imagine. Thankful is traveling the ocean with her cousin from the Americas to Italy aboard his vessel, when they come upon a wreckage of boats and people. Being a mender, Thankful finds herself upon vessel helping heal the wounded because the ships surgeon, Adam had been wounded. Long story short Thankful and Adam fall in love and retire back in the Americas. This is one story that I could not find myself enjoying. The way the story was written, I was unable to follow it smoothly. It felt like I had to consistently reread passages to try to make them make sense. Part of it was because I was unfamiliar with the “Friends” background. Their way of talking and their names had me stumbling through the story line. I didn’t feel as if the characters were strong. It’s hard to give a strong character in a small amount of words, but I believe it could have been better. Not very often do I find myself glad when a story is done, but I found myself grateful that this one was. Regina is a “spinster of thirty-two years” who had lost her one true love years ago. With a promise of, “I’ll come back, Reggie. I promise I will…” fifteen years later Ross is keeping to his promise. However, Regina was not too thrilled with this new turn of events. She had waited six years before being engaged with another man, only to break that engagement. Then those six years turned into fifteen. During those years, she stayed with her brother and kept his house after the death of his wife. During her nieces engagement ball Ross decided to surprise Regina and wanted to back in her life. She was not having it and literally throws Ross out of her home. It is up to Ross to prove his love for Regina and Regina must find forgiveness and let him back in. This was a very easy quick read. 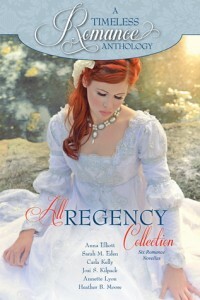 I have read Josi S. Kilpack before, but not in a regency setting. I enjoyed it and found myself liking her writing in this genre. This story touched my heart. As a married woman who loves romance, I find myself tired of the usual stories of first loves and swooning that getting married and then happily ever after. I enjoyed this story because it was a story of a couple that had been married for years and had older children that had found themselves strangers towards one another. Through lack of communication and a lost child, this couple grew apart. Bother missing each other, but both unable to speak of it. Being married doesn’t automatically make happily ever after one must work at it. This story gives me that reminder. A funny little story of a young woman, Mabel, who was different from what society had expected of young women. Raised by her father, a scientist, Mabel found herself more interested in the creepy crawly species than that of the human variety. Collecting insects and going out in rainstorms to collect slugs was where her heart lay. Her older sister Ethel was intent on getting Mabel out in society and hoping to turn her young wayward sister “normal.” In doing so Mabel is introduced to Ethel’s brother-in-law, the Duke’s brother, who quickly falls victim to Mabel’s charms and scientific ways. This was a very enjoyable fun quick read that anybody with a “weird” personality can relate.